Wasabi cheese is always worth stopping the car to taste. That was the lesson I learned from recent trips to Tasmania. On Highway One between Launceston and Devonport at Elizabeth Town stands the Ashgrove cheese factory. Their Wild Wasabi Cheese really tastes of wasabi – but the leaves are used rather than the root so there’s the flavour but not the heat. There are moments on a good road trip when you take a deep breath of satisfaction. Tasmania always provides that. For me that was while driving through Upper Castra, the cutest imaginable rural village. Behind us was Tasmania’s north coast with quaint little seaside towns like Penguin and Stanley and ahead rose the seried ranks of the Western Tiers and Cradle Mountain. Pretty little farms filled every valley. In the past when all my holidays were by motorcycle, Tasmania was my favourite destination. Empty, winding country roads through picturesque green countryside and friendly locals combine with enough sights and attractions to fully occupy a few weeks. It was certainly the most accessible “overseas” motoring holiday on offer and I came to love the island state. Recently, I’ve had the chance to drive Tasmania in summer and winter and the romance is renewed. All the earlier benefits are still there but Tasmania has evolved with better accommodation and more sophisticated tours. Most of all, Tasmania has become a gourmet larder packed with great wines and produce. One of the great things about motoring in Tassie is that you drive somewhere and the drive is spectacular then you walk or tour beyond the end of the road and the experience becomes even better. 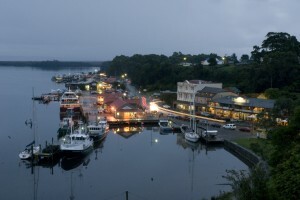 The two great wilderness destinations are Strahan and Cradle Mountain. The best easy short walk at Cradle Mountain is the two-hour circuit of Dove Lake under the spires of Cradle Mountain, and for a longer challenge there’s the hike up to the summit of Cradle Mountain, a good solid day of clambering over large rocks to a spectacular viewpoint. If you have less than an hour, take the Enchanted Walk – the boardwalk follows a stream, there’s a pretty waterfall and you have a chance of seeing wallabies (Bennett’s or Rufus) and maybe a wombat. A slightly longer walk leads to beautiful Knyvet Falls. Of course, one of Australia’s best alpine hikes is the Overland Track, the complete 6-day traverse south to Lake St Clair. The whole 161,000 hectare park is within the grand Tasmanian Wilderness World Heritage Area. While the outdoors is the primary attraction, take time to visit the Wilderness Gallery. Particularly moving is the permanent display of the late Peter Dombrovkis’ photographs including “Morning Mist, Rock Island Bend”, Franklin River, Tasmania, 1979, an image that can justifiably be regarded as the one that stopped a dam. The best way into Strahan is on the coastal road from the old mining town of Zeehan that takes you past the Henty sand dunes. Entering town, at first there’s a few fishing shacks then you burst onto the waterfront of Macquarie Harbour. There’s a dock on one side, with fishing boats and tourist boats bobbing alongside, and a pub on the other. Strahan is the accessible face of wild Tasmania and you have to walk no further than the jetty or the train station out at Regatta Point to start your adventure. Head over the hill to Letts Bay, a confusion of tiny coastal shacks with not a fence to be seen that’s a fishing village from your grandparents’ childhood. History has left Strahan with a wealth of tour options. The penal colony on Sarah Island is a pretty sight when visited on a sunny day – greatly different from its grim past. The challenging tides and rips around the bleak harbor entrance that the prisoners named Hells Gates are more apt reminders of the challenges they faced. There’s now a three-hour twilight tour by a high-speed boat that can carry 10 passengers to the lighthouse on Bonnet Island at Hells Gates. There’s time to taste some local wines and cheeses before landing on the tiny island. Darkness has fallen and by torchlight we see little blue penguins everywhere. Two are bickering on the trail and others are peering out through the undergrowth. The noisy birds’ cries resound through the stillness and we’re thrilled to see these endearing creatures in their own world. The next day we are on a boat heading up the tranquil Gordon River and take a stroll along a boardwalk through the verdant forest of Tasmania’s southwest. The reflections in the tea-coloured river are perfect. 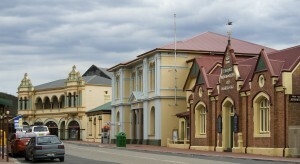 The town of Strahan was founded in 1877 as the port for mines in Zeehan and Queenstown. The West Coast Wilderness Railway is along a rail line that was built at the end of the 19th century and hauled ore from Queenstown to Strahan until 1963. All aspects of the six-hour rail journey are very green from the dense rainforest it passes through to the commentary en route, and the whole tour operation. The diminutive steam engine has an endearing “toot” but a strong engineering pedigree. The gradients are so steep that it uses an Abt rack system, like trains on Switzerland’s Matterhorn. On hills a ratchet drive attaches to a screw rail to both pull the train up and slow the descent. To turn the locomotive the driver and engineer rotate the turntable by hand while the engine sits and picturesquely billows steam. The journey ends in Queenstown, once a barren, blighted, polluted moonscape but now a pleasant mountain town. Nowhere is Tasmania’s new mood more evident. After just a few days driving and touring in Tasmania I returned home refreshed. Mountain walks in the very fresh air, nights in cosy B&Bs and stylish lodges, vistas of green forests and farmlands, encounters with wallabies and penguins and wombats, and some excellent Tamar Valley pinot noirs all contributed. It’s time to plan a return to Tasmania’s wonderful wild experiences.